Louis Vuitton or shortened to LV, is a house founded in 1854 by Louis Vuitton. The label’s LV monogram appears on most of its products, ranging from luxury trunks and leather goods to ready-to-wear, shoes, watches, jewelry, accessories, sunglasses and books. Louis Vuitton is one of the world’s leading international fashion houses. The first to letters in the date code tells you where the product is made. Products from the beginning of the 1980’s are marked with date codes. Products prior to 1980 do not have date codes. The date codes are printed on various places depending on the product. The numbers of the date code gives you the year/month/week depending on the model. 3-4 numbers. The numbers represent the year and the month. Example: 8412 = Year 84, Month 12 (December). Letters started preceding the numbers from around 1989. The second and fourth number represents the year and the first and third number represents the month. “SP1014”, means that the product was manufactured in November of 2004, in France. The code has the following format BA 1014. The second and fourth number represents the year and the first and third number represents the month. BA1014, means that the product was manufactured in November of 2004, in France. Since 2007 the second and fourth numbers still represent the year, however the first and third numbers now represent the number of the week in which it was produced. “AR2111”, means that it was manufactured during the 21st week of the year (May) 2011, in France. The Keepall is equipped single and double zipper models depending on the year of production. Single zipper models were produced in the beginning of the 1980’s. ECLAIR produced the zipper hardware on the single models. The Single zipper model allows a lock to be passed through the zipper tab and an leather attachment on the side of the bag. The Double zipper model allows a lock to be passed through the two zipper-pulls and a hole in the leather zipper tab. Louis Vuitton Keepall come in four models: 45, 50, 55 and 60. The different models name’s is also the length in centimeter of the bag. Louis Vuitton Keepall is available with or without shoulder strap. The one with shoulder strap is called “Keepall Bandoulière” and the model without just “Keepall”. 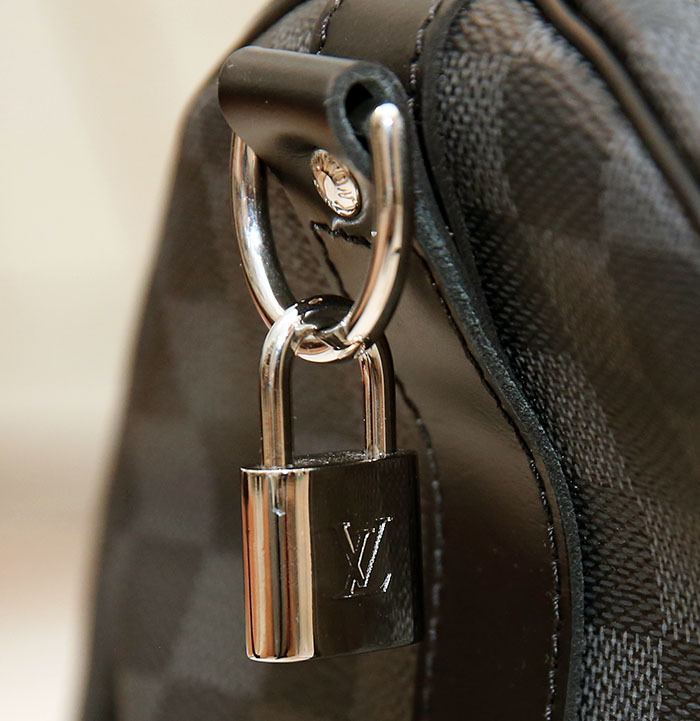 Accessories available to the bag are padlock, name tag, and when it’s a “Keepall Bandoulière”, a shoulder strap. The hardware, i.e the lock, should feel heavy and solid.